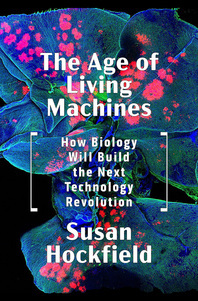 The Age of Living Machines - Description | W. W. Norton & Company Ltd.
A century ago, discoveries in physics came together with engineering to produce an array of astonishing new technologies: radios, telephones, televisions, aircraft, radar, nuclear power, computers, the Internet and a host of still- evolving digital tools. These technologies so radically reshaped our world that we can no longer conceive of life without them. Today we are on the cusp of a new convergence, with discoveries in biology coming together with engineering to produce another array of almost inconceivable technologies. These next-generation products have the potential to be every bit as revolutionary as the twentieth century’s digital wonders: Virusbuilt batteries. Protein-based water filters. Cancer- detecting nanoparticles. Mind- reading bionic limbs. Computer-engineered crops. These few examples illustrate the promise of the technology story of the twenty-first century to overcome some of the greatest humanitarian, medical and environmental challenges of our time.